Multicultural Ministry Matters: Should I tell them it's my third time 'round...? 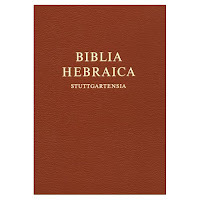 The Biblia Hebraica Stuttgartensia ("BHS") is the state-of-the-art Hebrew old testament for students. Not only does it have the Hebrew from the best old manuscripts; it's got notes that give additional information - about variances in old manuscripts, unusual words, occurrences of words... etc. These additional notes are called the "apparatus". Usually a second-hand BHS would be at least $100. I just got one for free. From the Bible society. As a gift to first-year Hebrew students. Should I tell them it's my third attempt...? Great that they've abandoned that little black one... shame it happened a year too late for me. confess! and hand it on to a worthy.